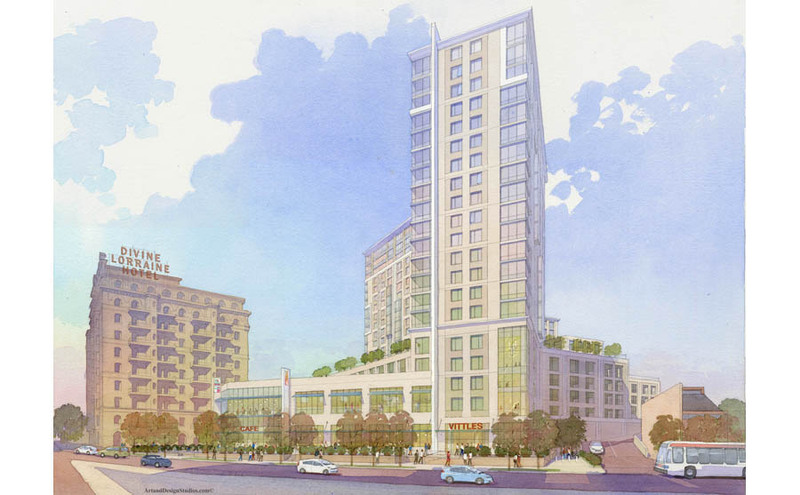 Watercolor rendering of 1300 Fairmount Avenue mixed-use commercial/residential development. Architectural watercolor technique. RAL, a New York-based development company, plans to bring 486 apartments to the site over multiple phases, with a supermarket as the retail&nbsp;anchor of the project. The two development teams - RAL and EB Realty Management, the developers of the Divine Lorraine -;were working closely to ensure that the design of each building works with the other. The result is a more modern 19-story tower set with its massing set away from the Grand Dame of North Broad on Ridge Avenue.